The Lumenier QAV-X CHARPU FPV racing quadcopter is a symmetrical X, light weight, super stiff, finely tuned airframe designed for high performance FPV Drone Racing. 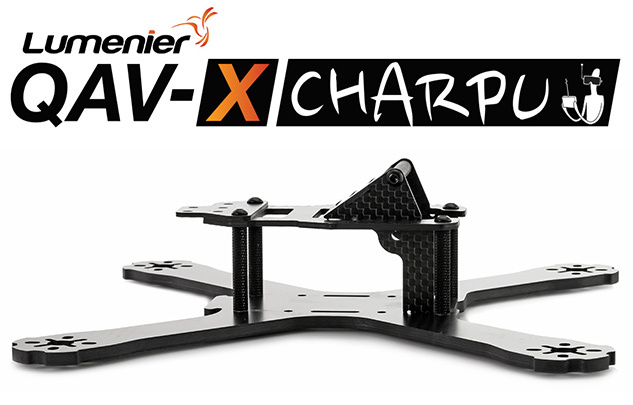 The QAV-X was created in collaboration with and named after the World-Famous Lumenier team pilot, CHARPU. This racing airframe is stripped down to the bare essentials without sacrificing strength and durability. Buy the Lumenier QAV-X CHARPU FPV Racing Quadcopter here. The main "unibody" 3mm or 4mm plate is CNC milled out of a solid sheet of premium Lumenier carbon fiber. The outer weave of the carbon fiber runs 100% down each arm of the QAV-X (0/90 weave), maximizing the strength of the carbon and arms. The center layers are offet at 45 degrees providing even and balanced strength throughout the entire plate. Included with the QAV-X CHARPU kit is the popular Lumenier 4Power power distribution board which can be fitted with an optional Pololu voltage drop-down circuit (to 12v or 5v), a XT60 pig-tail. Like the QAV210/180, the QAV-X kit enables mounting of small FPV camers such as the Lumenier CM-650 in a fully encased assembly which protects the FPV camera during crashes and enables pointing the FPV camera at a wide variety of viewing angles. Full 3K Carbon Fiber airframe featuring a solid 3mm or 4mm main plate. Airframe (3mm unibody plate): 72g (airframe + hardware), 77g (with battery protector plate). Airframe (4mm unibody plate): 88g (airframe + hardware), 93g (with battery protector plate). Download QAV-X CHARPU logo artwork for your own video here. Lumenier QAV-X CHARPU FPV Quadcopter flown by CHARPU himself! I love the Lumenier Frames. I fly a QAV-R 5" right now thinking about getting a spare Quad just in case. I only use TBS gear ans so I'd like to know if you can fit a Powercube inside this Frame? It looks like the FPV Cam will block the space required to mount a Powercube inside wich is really a shame. Do you think about doing some spare camplate to move the FPV-cam more towards the front and make some space for a Powercube? Last edited by AlyxAT; 14th July 2016 at 02:40 PM. What he said. Ordered tje frame so would appreciate some feedback on this so its possible to prepare the rest of the build. Thanks! When will parts be available? Specifically the main frame/baseplate. I don't buy kits, but am definitely interested in purchasing just the baseplate. Pretty sweet compact design. can you mount a runcam hd2 to this or is it just designed for the gopro as shown? Any of the Lumenier 2204 or 2206 motors would work very well. The higher kv, 2300 and up is prefered on 5" props on 4s for the racers. The 2206 will have a little more low end torque, where the 2204 will be lighter. Spare parts will be available shortly after the first shipment of kits, probably 1-2 weeks after. Kits should be shipping out in 1-2 weeks! It was designed for the GoPro, but yes you can also mount other cameras. Simply use the top plate to wrap a strap around and secure the camera of your choice.